The legislative branch is responsible for determining how much the US government spends on behalf of the American people. 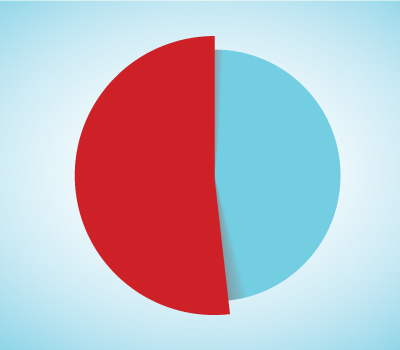 The federal budget includes both mandatory and discretionary funding. The funding process begins with a budget resolution that lays out a framework for Congress to follow when setting spending limits and developing the corresponding policy. Should Congress desire to adjust tax policy or mandatory spending amounts for programs like Medicare and Medicaid, the budget resolution for that fiscal year must include “reconciliation instructions.”1 The instructions designate the dollar amount as well as the committees responsible for producing the legislative proposals. The Budget Committee compiles the policy recommendations submitted by the committees of jurisdiction into a single reconciliation measure that may be considered by the full House. The Budget Committee’s responsibility is to simply manage the process, not to develop the policies that will have the budgetary impact called for in the reconciliation instructions. 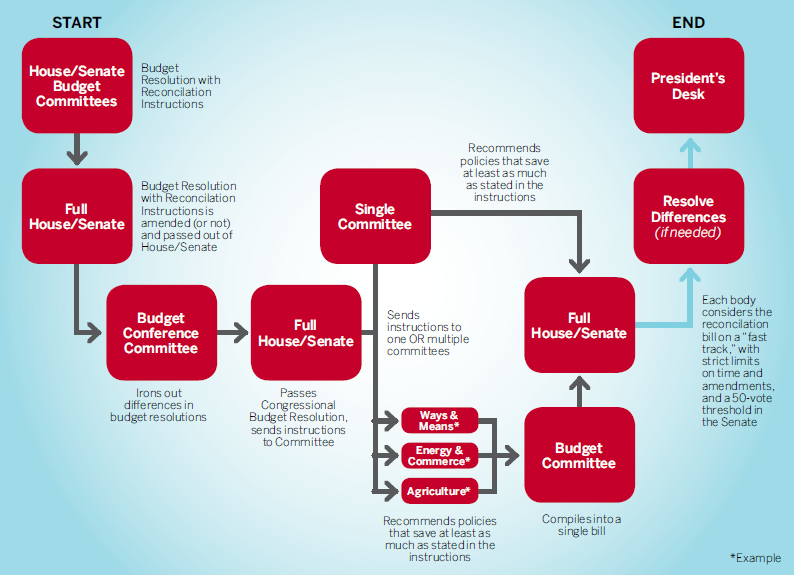 The House and Senate each have their own rules to guide its legislative process. Most legislation is passed under regular order. However, using reconciliation improves the chances for passage of significant yet contentious legislation like the Patient Protection and Affordable Care Act. This alternative and expedited law-making process loosens some procedural requirements while simultaneously imposing considerable limitations. In recent years, lawmakers have used reconciliation to reform health care policy. As has been mentioned, in 2010 it was used to help pass the Affordable Care Act (ACA) or “Obamacare,” which was signed into law. It was used again in 2016 when the House and Senate passed a bill to repeal key elements of the ACA. However, that attempt failed when the legislation was vetoed by President Obama. The Fiscal Year 2017 budget reconciliation instructions named four committees with jurisdiction over health care policy: the Senate committees on Finance and on Health, Education, Labor, and Pensions (HELP), the House Committee on Energy and Commerce as well as the House Ways and Means Committee. Each committee was requested to “submit changes in laws within its jurisdiction to reduce the deficit by not less than $1,000,000,000” for the standard budget window of 10 years (fiscal years 2017 through 2026).11 As of this writing, the named committees of jurisdiction are formulating their legislative proposals in accordance with the reconciliation instructions. Reconciliation can be used to make changes to parts of the ACA that impact tax and spending, such as altering the federal investment in Medicaid, repealing the fine imposed on those who do not purchase health insurance, as well as adjusting the taxes levied against high-value, employer-provided health insurance. It is important to note that because the use of reconciliation is limited to legislative changes that would have an effect on the federal budget, some well-known elements of the ACA cannot be altered using this mechanism. 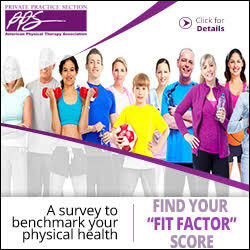 For example, current law that ensures that children up to age 26 may remain on their parents’ insurance policy as well as the requirement that all consumers are able to obtain insurance even if they have a preexisting condition would have to be changed under regular order. 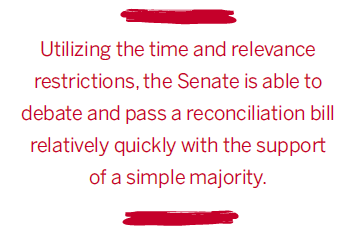 The Senate is effectively limited to one budget reconciliation bill per fiscal year. This is because only issues of tax, spending, and debt limit can be addressed through this mechanism and each of those categories is allowed to be the subject of only one bill per budget reconciliation instruction.12 This restriction “is most significant if the first reconciliation bill that the Senate takes up affects both spending and revenues. Even if that bill is overwhelmingly devoted to only one of those subjects, no subsequent reconciliation bill considered that same fiscal year can affect either revenue or spending because the first bill has already addressed them.”13 This year, lawmakers chose to use reconciliation to modify health care policy—which impacts both taxation and spending. Despite being fully aware of the functional limitations of a single reconciliation instruction per fiscal year, the content of the bills adopted by the House and Senate will often be different. When this happens, the differences between the two versions must be resolved, usually by a conference committee consisting of members from both the House and the Senate. The bill will then be returned to both legislative bodies for an up-or-down vote on the final, compromise version. If this final version of the legislation receives a majority vote in both chambers, the bill will go to the President. The President can either sign the legislation into law or veto it. 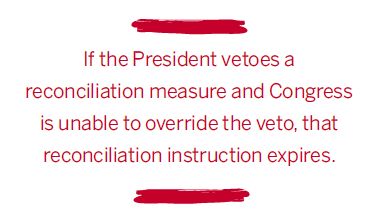 If the President vetoes a reconciliation measure and Congress is unable to override the veto, that reconciliation instruction expires. Should Congress be unable to complete health care reform using this current reconciliation instruction, it will not be able to renew these efforts until fiscal year 2018. Due to their narrow majority in the Senate, Republicans see the use of reconciliation as their best option to make changes to the ACA. It will be a bumpy road—as we have seen with the failure of the first attempt to repeal and replace—as the procedural rules are strict, the underlying policies are contentious, and public opinion is not only divided but vocal. Furthermore, consensus on the extent to which the ACA should be altered or simply repealed remains elusive within the Republican delegation. As the year progresses, many options will be considered before the final package is developed, debated, and voted on by the full House, then the Senate. Should the attempt to repeal or revise the ACA not be successful, Republican leadership will be forced to go back to the drawing board. 6. www.cbpp.org/research/federal-budget/introduction-to-budget-reconciliation. The Byrd Rule allows for inclusion of provisions that have no budgetary effect as long as they are determined to be necessary “terms and conditions” of other provisions within the bill that have a budgetary effect. 11. www.budget.senate.gov/imo/media/doc/HEN17065.pdf, pp. 45, 46.